The performance of your roof is crucial to your commercial building’s health. 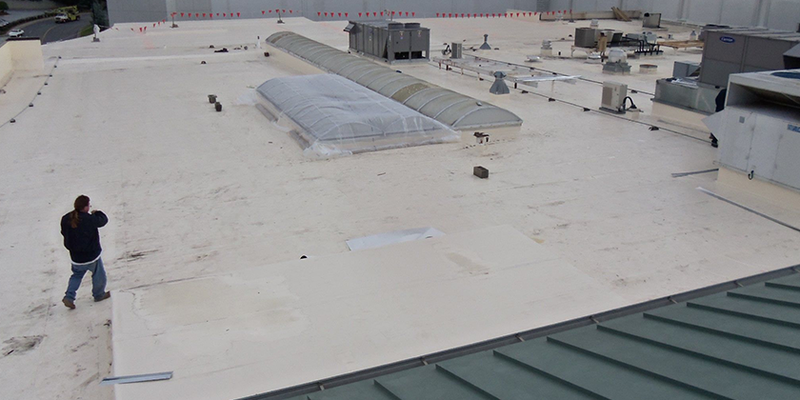 Consequently, commercial roof maintenance is imperative. Think of roof maintenance as a regular checkup on your roof to ensure that it’s up to standard, performing as designed, and likely to continue to do so. Without, you may end up with expensive and disruptive problems on your hand. A typical commercial roof maintenance plan will include regular visits to address housekeeping such as debris removal from drains and gutters. While an absolute “no-brainer” for commercial property owners and managers, maintenance is inconsistently performed and ends up contributing to premature failure of roofs, gutters and downspouts. Out of sight, out of mind, I guess. Additionally, a commercial roof maintenance plan can help to recognize early signs of deterioration to your roof membrane and flashings and/or damage to your roof caused by debris, extreme weather or trades with access to the roof. Early identification of issues ensures repairs will be easier and cheaper to finish. Regular roof maintenance should keep any extensive damage from sneaking up on you. If your roof is still under a manufacturer’s warranty, you should dust it off and give it a read. It most certainly states that the warranty will remain in force only if the roof is regularly maintained. A commercial roof maintenance plan executed by a credible roofing professional will ensure that if your roof has a performance issue that is the result of material failure, you will have been fulfilling your obligations under the warranty along the way. Your commercial roofing should last for decades. Unfortunately, the average commercial roof lifespan is well below that. Poor or lax roofing maintenance, is a major contributing factor to premature roof failures. Additionally, it’s been proven that regular roof maintenance can extend a roof’s life well beyond a manufacturer’s warranted term. A few operating dollars spent annually on maintenance can help delay a large and disruptive capital project. A premature or, worse yet, sudden roof replacement project is a bitter and expensive pill for any business to swallow. You never want to slack on your maintenance plan! Enlist a qualified roofing professional to ensure that your roof remains healthy and your building watertight. If you’re interested in learning more about commercial roofing, contact Innovative Roofing Group at 404-594-6038 today!